01 Feb 2013 PacktPub kindly offered me a free review edition of Gradle Effective Implementation Guide written by mrhaki Hubert Klein Ikkink. As I planned to read it anyway I agreed to write a review of it. Maven was huge for Java Development. It brought dependency management, sane conventions and platform independent builds to the mainstream. If there is a Maven pom file available for an open source project you can be quite sure to manage to build it on your local machine in no time. But there are cases when it doesn't work that well. Its phase model is rather strict and the one-artifact-per-build restriction can get in your way for more unusual build setups. You can workaround some of these problems using profiles and assemblies but it feels that it is primarily useful for a certain set of projects. Gradle is different. It's more flexible but there's also a learning curve involved. Groovy as its build DSL is easy to read but probably not that easy to write at first because there are often multiple ways to do something. As a standard Java developer like me you might be unsure about the proper way of doing something. 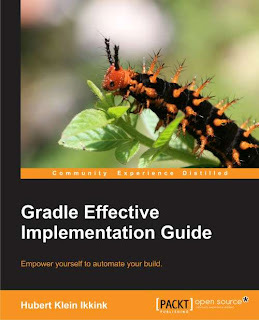 There are a lot of helpful resources online, namely the forum and the excellent user guide but as I prefer to read longer sections offline I am really glad that there now is a book available that contains extensive information and can get you started with Gradle. The book starts with a general introduction into Gradle. You'll get a high level overview of its features, learn how to install it and write your first build file. You'll also learn some important options of the gradle executable that I haven't been aware of. Chapter 2 explains tasks and how to write build files. This is a very important chapter if you are not that deep into the Groovy language. You'll learn about the implicitly available Task and Project instances and the different ways of accessing methods and properties and of defining tasks and dependencies between them. Working with files is an important part of any build system. Chapter 3 contains detailed information on accessing and modifying files, file collections and file trees. This is also where the benefit of using Groovy becomes really obvious. The ease of working with collections can lead to very concise build definitions though you have all the power of Groovy and the JVM at your hands. The different log levels are useful to know and can come in handy when you'd like to diagnose a build. While understanding tasks is an important foundation for working with Gradle it's likely that you are after using it with programming languages. Nearly all of the remaining chapters cover working with different aspects on builds for JVM languages. Chapter 4 starts with a look at the Java plugin and its additional concepts. You'll see how you can compile and package Java applications and how to work with sourceSets. Nearly no application is an island. The Java world provides masses of useful libraries that can help you build your application. Proper dependency management, as introduced in Chapter 5, is important for easy build setups and for making sure that you do not introduce incompatible combinations of libraries. Gradle supports Maven, Ivy and local file based repositories. Configurations are used to group dependencies, e.g. to define dependencies that are only necessary for tests. If you need to influence the version you are retrieving for a certain dependency you can configure resolution strategies, version ranges and exclusions for transitive dependencies. Automated testing is a crucial part of any modern software development process. Gradle can work with JUnit and TestNG out of the box. Test execution times can be improved a lot by the incremental build support and the parallelization of tests. I guess this can lead to dramatically shorter build times, something I plan to try on an example project with a lot of tests in the near future. This chapter also introduces the different ways to run an application, create distributions and how to publish artifacts. The next chapter will show you how you can structure your application in separate projects. Gradle has clever ways to find out which projects need to be rebuild before and after building a certain project. Chapter 8 contains information on how to work with Scala and Groovy code. The necessary compiler versions can be defined in the build so there is no need to have additional installations. I've heard good things about the Scala integration so Gradle seems to be a viable alternative to sbt. The check task can be used to gather metrics on your project using many of the available open source projects for code quality measurement. Chapter 9 shows you how to include tools like Checkstyle, PMD and FindBugs to analyze your project sources, either standalone or by sending data to Sonar. If you need additional functionality that is not available you can start implementing your own tasks and plugins. Chapter 10 introduces the important classes for writing custom plugins and how to use them from Groovy and Java. Gradle can be used on several Continuous Integration systems. As I've been working with Hudson/Jenkins exclusively during the last years it was interesting to also read about the commercial alternatives Team City and Bamboo in Chapter 11. The final chapter contains a lot of in depth information on the Eclipse and IDEA plugins. Honestly, this contains more information on the Eclipse file format than I wanted to know but I guess that can be really useful for users. Unfortunately the excellent Netbeans plugin is not described in the book. The book is an excellent introduction into working effectively with Gradle. It has helped me to get a far better understanding of the concepts. If you are thinking about or already started working with Gradle I highly recommend to get a copy. There are a lot of detailed example files that you can use immediately. Many of those are very close to real world use cases and can help you thinking about additional ways Gradle can be useful for organizing your builds.